Over the past two years Karolinska Development has successfully repositioned itself, with the investment strategy firmly focussed on disruptive technologies that could materially alter current treatment models. New management has re-galvanised the entire organisation, with a greater emphasis on an active investment in these mid- and late-stage opportunities. Our DCF-based valuation of the four main investments alone suggests a value of SEK473m, SEK9.10 per share, which represents an uplift of 52% to the current market value, with the remaining six portfolio companies representing further upside. Creating a conducive environment There has been a major transformation at Karolinska Development over the last 18 months, with significant strategic changes to the investment philosophy. New management has overseen the restructuring of the business, rationalisation of the portfolio, and strengthening of the balance sheet. Now the focus is on effective execution of the strategy, with clear delivery on critical milestones ahead of potential exit (either through trade sales, IPOs, or licensing deals); which we believe are possible from 2017/8 onwards. Portfolio is maturing across all fronts The four main investments are all progressing towards material value inflection points. Aprea’s APR-246 is a leading candidate in targeting the key regulatory protein P53, with the results of a pivotal proof-of-concept trial expected in 2018. A successful outcome would suggest a broad range of indications beyond recurrent ovarian cancer. Modus Therapeutics’s sickle cell treatment is due to report equally important results in H117; whilst OssDsign and Promimic are embarking on the paths to commercialisation, with recurrent revenues expected in the near-term. Share price doesn’t reflect the underlying value We value Karolinska Development using a sum-of-the-parts DCF-based valuation of its four leading investments. In view of the earlier stages of other investments we assign no value to these remaining assets, and hence they represent additional upside. Our valuation of SEK473m (equivalent to SEK9.10 per share) suggests an upside of 52% against the current market value. Karolinska Development traces its origins to 2003, when it was created to help finance the many medical and pharmaceutical innovations arising from the highly-renowned Karolinska Institutet. A material strategic shift saw the introduction of new management in 2015, with the aim of creating a Nordic life sciences investment vehicle that has a broader remit yet a more focussed portfolio. A number of divestments have been made, with funding channelled into companies that combine significant commercial potential with clear near- and mid-term value inflection points. The portfolio now consists of 10 companies that are developing novel treatments for life-threatening and seriously debilitating diseases. The investment case rests on the real value of the portfolio and the progress within each of the companies. There is potential for significant value creation as exits (typically trade sales, IPOs, and/or license deals) are achieved at valuations in excess of generally modest carrying values. We value Karolinska Development at SEK473m (equivalent to SEK9.10 a share) based on a sum-of-the-parts valuation of its four leading investments. These are valued using DCF-based methods, including rNPV models for the biotech investments and three-phase DCF valuations for those with marketed products. At this stage we assign no value to the remaining assets, which tend to be at earlier stages with lower predictability or in which Karolinska has small equity position, and hence they represent further upside. Throughout we have employed conservative assumptions. Karolinska Development is now able to fund appropriately all of its portfolio companies, with an estimated c SEK50m earmarked for follow-on funding rounds. We estimate that Karolinska could invest over SEK100m in other companies, should it identify attractive investment opportunities. The investment case rests entirely on the success of the investment strategy, in particular the ability to achieve increases in portfolio value over and above net new investment. Karolinska Development is most exposed to the business success of its four larger portfolio holdings. A significant success or set-back is likely to not simply affect the portfolio value but also impact investor sentiment. The last two years have seen a seemingly subtle yet highly significant transformation in Karolinska Development’s outlook. A strategic review has resulted in new management being introduced, a greater commercial focus being adopted, and a more rigorous investment methodology employed. The restructured portfolio now consists of 10 companies with novel products that address sizeable market opportunities. Four of these are approaching key value-inflection points over the next 12-24 months. Our DCF-based valuation of SEK473m (SEK9.10 a share) suggests the shares are undervalued by c 52%. Karolinska Development has undergone a major transformation over the past two years. Although outwardly the shift in investment philosophy may appear subtle, the impacts on the organisation are material and the effect on the investment portfolio’s future performance likely to be significant. The origins lie in the Board’s decision in 2014 to alter the operating structure and establish a commercially focussed investment vehicle. This was instigated by the Chairman, Bo Jesper Hansen, who revitalised the Board experienced management with proven track records. Fresh financing, SEK450m in H115, strengthened the balance sheet and new investors were introduced. The strategy now is to direct investment towards therapeutic and medtech companies that have genuine commercial potential and near- to mid-term value inflection points. The change in emphasis saw a thorough portfolio review and resulted in several divestments being made, with the number of active investments reduced from 21 (Dec 14) to the current 10. Management has been careful to retain an economic interest in most of the divested companies (including Axelar, Athera Biotechnologies, Clanotech, Oncopeptides, Pharmanest, and XSpray Microparticles) with additional value expected to accrue. A key aim is to ensure that all portfolio companies are financed to the next value inflection point, which is achieved through direct funding and proactively syndicating investment with the appropriate international life sciences funds. In addition to broadening its investment reach and reducing the overall portfolio risk, such co-investment with experienced specialists serves as valuable third-party endorsement for the technological approaches and the attractiveness of the market opportunities. Karolinska Development’s investment case rests on the rate of value-addition within the whole portfolio of companies and, particularly, the outcomes of the four later-stage companies. The new management has a proven track record of making judicious investments – Jim Van heusden, CEO, previously managed a portfolio worth €170m and realised an IRR of 30.4% at the venture capitalist Gimv – which augers well for the future. Clearly, the most value creation would arise from an exit, such as IPO, trade sale, or licensing deal(s). Although timings are difficult to predict, the improving visibility suggests that, assuming current progress is maintained, the first could happen within the next 18 months. Whilst the original remit was to fund and develop the technologies that arose from the various research programmes at the Karolinska Institutet, the recent shift in investment philosophy has seen that remit broadened to cover attractive therapeutic and medical technology innovation from universities and academic centres across the Nordic region. Concurrently, the stage of investment is now more flexible too. Historically the selected programmes tended to be early-stage with Karolinska Development taking a sizeable stake, usually a majority holding, and nurturing these embryonic businesses through the difficult first years. Now the strategy allows for a non-controlling investment in more mature companies, where the reduced timescale to a value-inflection point means a financial return may be more material and, importantly, may be realised more quickly. The new management is also leveraging its extensive network by syndicating deals with specialist international life sciences funds. This not only allows for a greater breadth of investment but significantly reduces risk and, as mentioned later, also acts as useful third-party validation. The SEK437m ($51m) financing of Aprea in March 2016, which involved a syndicate of leading life sciences investors from the US, Canada and Sweden, is a pertinent example of the merits of the approach. The outcome of these changes in philosophy is a portfolio that has a more balanced mix of early- and later-stage businesses; is better able to access appropriate financing; carries a reduced operating and investment risk; and has a greater profile among external specialist investors. The portfolio has been streamlined from the 21 investments of December 2014 to the current 10 (Exhibit 1). These companies have been selected because they are developing differentiated and commercially attractive products that have the potential to demonstrate compelling clinical and health economic benefits. These are all financed through to their next relevant value inflection point, typically within a period of six to eighteen months. As the new strategy continues to be implemented the onus for the remainder of this year and next is on execution, with progress measured on delivery of defined milestones on the path to commercialisation, ahead of the first of several potential exits from 2018/9 onwards. Karolinska Development has developed a well-structured selection process to identify the most commercially attractive medical innovations. The philosophy, see Exhibit 2, is to use its existing network and collaborators to identify and develop transformational research and technologies that originate from leading universities, teaching hospitals, and research institutes from across the Nordic region. The focus is on developing the companies that have near-term value inflection points and, where appropriate, syndicating these investments with experienced and knowledgeable life science investors. In addition to helping to provide the funds necessary for growth and further development, securing such external investment is valuable from other perspectives (eg bringing specialist industry knowledge). Importantly, it gives a third-party validation for the various technological approaches and/or market opportunities and it also offers an explicit valuation (carrying value) for the investment within the portfolio. The earlier stage businesses are actively nurtured through to the point when specialist operational management is appointed, whilst the more mature companies are supported financially and strategically (mainly through board appointments). All investments are made with deliberate consideration of the financing requirements that allow progress to the next defined value inflections point. For pharmaceutical and biotech products this tends to be when meaningful clinical data is expected (eg the proof of concept is usually Phase IIa trial results), and for medtech companies and other technologies it is when they become cash flow positive. Aprea is a private Swedish company that is developing novel small molecules targeting the tumour suppressor protein p53 pathways. The p53 protein is normally present in all cell types, where it plays an integral role in regulating the cell cycle. It is at the centre of a complex network of proteins that monitor the genetic health of a cell; when damage is detected p53 orchestrates responses that, depending on the degree of mutation, either initiates repair mechanisms (cell-cycle arrest for DNA repair or senescence for growth regulation) or induces apoptosis (cell death). p53 triggers apoptosis through multiple mechanisms, including mitochondrial and death receptor pathways, cytoskeleton changes, suppression of survival signalling, and induction of hypoxia. Due to this key function in stabilising cell mutation and proliferation, p53 has been described as the “guardian of the genome”. The nature of the p53 interactions has generated a number of drug approaches, ranging from gene therapy to classical small molecules. The various methods can be envisaged as reactivation of mutant p53, such as the stabilising of protein folding, and blocking the effects of p53 inhibitors, such as Mdm2 and MdmX. APR-246 traces its origins to research at Karolinska Institutet led by Prof Klas G. Wiman in 2000. A targeted screening programme of a chemical library of the National Cancer Institute led to an initial compound, APR-017 (also known as PRIMA-1) being identified. Lead optimization resulted in the more potent and drug-like APR-246. These, and similar compounds (including back-up analogues), have extensive intellectual property rights, with broad protection through five patent families. Pre-clinical testing showed APR-246 has inherent anti-cancer activity but also demonstrated synergistic effects when used with traditional chemotherapy (such as cisplatin). This includes treatment resistant tumours, which suggests reactivation of p53 re-sensitises cancer cells to the chemotherapy. A Phase I study in 22 patients with haematological malignancies (mainly AML with 7 patients) and prostate cancer (also 7 patients) showed APR-246 (as mono-therapy) to be safe at the predicted therapeutic plasma levels, with a suitable pharmacokinetic profile, and able to induce measurable p53-dependent biologic effects. The suggested maximum-tolerated dose (MTD) was c 60mg/Kg. The first phase of Phase Ib/II study (PiSARRO) in relapsed ovarian cancer was reported at ASCO in June 2016. This evaluated APR-246 (at escalating doses of 35, 50 and 67.5 mg/kg) in combination with carboplatin and pegylated liposomal doxorubicin (PLD), in 28 patients with recurrent p53 mutant platinum sensitive high grade serous ovarian cancer. The main toxicity attributable to APR-246, rather than chemotherapy, was dizziness (20/28 patients) and this resolved within 24 hours of infusion. Encouraging activity was seen in both partially and fully platinum-sensitive patients. Further data was presented at ESMO in October 2016 showing that of 22 patients with radiologically measurable lesions, 3 had confirmed complete response, 10 had confirmed partial response, 8 had stable disease and 1 was not evaluable. For the 2 patients with non-measurable disease, 1 had complete response and 1 had progressive disease. Median progression-free survival for the 22 evaluable patients, as measured by RECIST or GCIG, was 316 days (95% CI, 280-414 days) and was not influenced by the length of previous platinum treatment-free interval or dose cohort. APR-246 showed linear pharmaco-kinetics with no accumulation and low intra-patient variability. There was no indication of interaction between APR-246 and chemotherapy, supporting the combination of APR-246 with carboplatin and PLD at relevant doses. The side-effect profile was similar to earlier findings with the most frequent treatment-emergent adverse events have been low grade GI (nausea/vomiting), CNS (dizziness and fatigue) and hematological (neutropenia and thrombocytopenia) events. A dose of 67.5mg/Kg will be carried into the next study phase. The Phase II element, which enrolled its first patient in October 2016, will see up to 400 relapsed, p53-mutated high-grade serous ovarian cancer patients in Europe and the United States randomised into two equal treatment arms; these will evaluate up to six cycles of carboplatin and PLD, and carboplatin and PLD plus APR-246. Patients will be followed for safety, response (Recist 1.1 and CA125 (GCIG criteria)), and several secondary endpoints, but the primary endpoint will be progression free survival (PFS). This phase of the trial is expected to complete in 2018. APR-246 is administered as an i.v. infusion but related compounds, using the same chemical scaffold, are being developed for oral administration. Assuming smooth progress, management expects market launch around 2020. From an investment perspective the key inflection point will happen when the Phase II trial results are known as this will effectively be the “proof of concept” and, we suspect, could rapidly lead to a material liquidity event. Although the studied indication of stage II-IV recurrent ovarian consist of only around 20,000 patients per annum, a successful outcome would likely lead to a broadening of this patient population as well as use in additional tumours being evaluated. Aprea successfully raised SEK437m ($51m, €46m) in a Series B financing round in March 2016. The funds will allow completion of the Phase II ovarian cancer trial as well as further exploratory trials in other cancer indications, including both solid and haematological tumours. Karolinska Development now owns 19% of Aprea (including indirect holdings through KDev Investments and KCIF Co-Investment Fund), with other specialist investors including Versant Ventures (US), 5AM Ventures (US), HealthCap (Sweden), and Sectoral Asset Management (Canada). Modus Therapeutics was previously known as Dilaforette until it changed its name in October 2016 and announced its intention to IPO. It is currently a private Swedish company that is developing sevuparin, a novel polysaccharide, for treating Sickle Cell Disease (SCD). Sevuparin is currently in Phase II trials in Europe and the Middle East, with results expected in H1 2017. 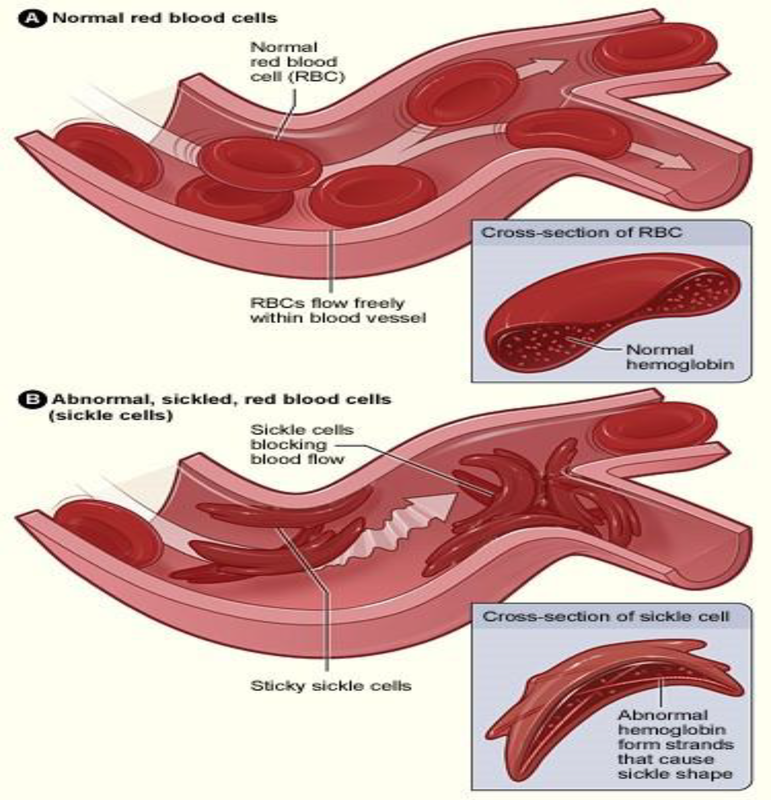 The hallmark of sickle cell disease is recurring episodes of severe, debilitating pain commonly known as sickle cell crisis or vaso-occlusive crisis (VOC). The intense pain experienced by patients is the result of obstruction of blood vessels by “sickled” red blood cells, which are rigid and highly adherent to the vessel walls and to each other. This obstruction leads to reduced blood flow to organs, including the bone marrow, not only causing severe pain, but also cumulative tissue damage and, ultimately, loss of vital organ function and significantly reduced lifespan. Sevuparin is a new chemically modified heparin with low anticoagulant activity that has the potential to become a major treatment for SCD. It is an anti-adhesion agent that works through antithrombin III-dependent inhibition of thrombin as well as blockade of P-selectin-mediated adhesion. The specificity should allow a decrease in the vaso-occlusion seen during a VOC but with a low impact on the typical heparin anti-coagulation activity. Preclinical data and early clinical studies show that sevuparin can have rapid and clinically relevant effects to prevent and resolve the micro-vascular obstructions of VOCs. The Phase II study is a 70 patient, multi-centre, double-blind, placebo-controlled study in hospitalised SCD patients experiencing VOCs. The patients are treated with i.v. infusion of sevuparin or placebo on top of standard pain medication, primarily opioids. This is an important Proof-of-Concept study that is designed to demonstrate reduced time to resolution of VOC – defined as freedom from parenteral opioid use and readiness for discharge from hospital. The study is being performed in Bahrain, Lebanon, Netherlands and Turkey in collaboration with Ergomed (a specialist CRO) as part of a co-development deal. Ergomed is co-investing a proportion of its revenues from the clinical and regulatory activities of this trial in return for an equity stake (believed to be around 10%) in Modus Therapeutics. The results of this important trial were expected to be reported in late-2016, however the rate of patient enrolment suggests H117 is now more likely. Sevuparin is the result of initial research performed at the Karolinska Institutet and Uppsala University. Karolinska Development (including through KDev Investments) currently owns 64% of Modus Therapeutics, with other investors including The Foundation for Baltic and East European Studies (Östersjöstiftelsen) and Praktikerinvest. A clinical collaboration agreement with Arabian Gulf University (Bahrain) provides up to $1.2 million in non-dilutive funding in return for royalties on sales in the MENA (Middle East and North Africa) region that are capped at $2.4m. No details of the proposed IPO have been made public as yet but currently, assuming a successful outcome in the SCD clinical trials, Ergomed will own c 10% stake. OssDsign’s principal products are OSSDSIGN Cranial, for reconstructing complex cranial defect, and OSSDSIGN Facial, used in surgical augmentation and reconstruction of facial bone contour defects. These are individualised for each application and employ three-dimensional CT scans to create implants that are perfectly matched to the underlying or remaining bone structures. The use of these bio-ceramic materials results in better blood flow, with improved vascularisation and tissue integration; improvements in soft tissue healing, with better aesthetic results; and sustained bone remodelling, as cell-mediated responses stimulate new bone formation. 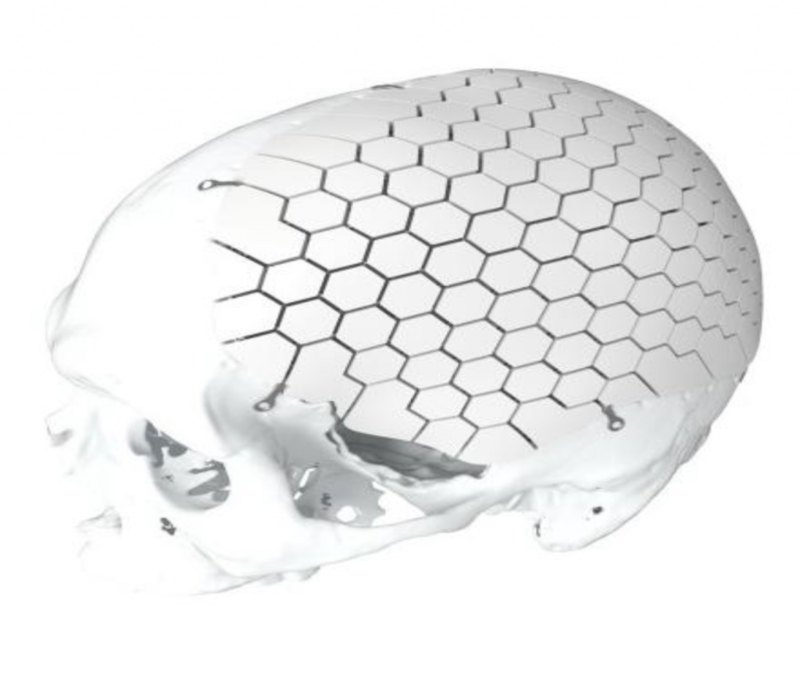 OssDsign markets the cranial and facial implants directly using a small, specialist sales team. The complex nature of the surgical procedures means the implants are used by a limited number of dedicated medical centres and these can be identified and accessed relatively easily. To date the products have been launched in Scandinavia, Germany and the UK, with commercialisation into the rest of Europe and in selected markets (such as Singapore, Malaysia and Israel) currently underway. A commercial presence is being established in the US, with a launch planned for H117. Preparations for the Japanese market are also progressing, with the timelines of the regulatory process suggesting a launch is possible in 2018. A strategy to access the Chinese market will be decided in 2017 (most likely a strategic partnership). Similarly, product opportunities outside the bespoke CMF segment, including the Cranioplug, are expected to be partnered. The management team has been strengthened by the appointment of a new CEO, Anders Lundqvist, in March 2015 and CFO, Claes Lindblad, in April 2016. The previous CEO, Bo Qwarnström, who nurtured the company from its formation, has been retained as VP Business Development. Also in April 2016, the well respected medtech executive Simon Cartmell joined as Chairman. Promimic is a Swedish biomaterials company that has developed a unique coating, known as HAnano Surface, that is used to improve the integration of implants into bones. It was founded in 2004 as a spin-off from research performed at Chalmers University of Technology in Gothenburg, Sweden. The HAnano Surface coating procedure is surprisingly simple. It is a patented wet chemical process where the coating liquid is applied directly onto the implant in one of three different ways (dipping, spraying, or dripping). The excess liquid is removed through spinning and pressurised gas, which is then followed by a short heat treatment. The coating is nanometre thin (around 20 µm) and suitable for a variety of surfaces (including porous) and shapes (including complex structures and geometries). The process is more cost effective than other coating methods and its flexibility means it can be integrated, using off-the-shelf equipment, into an implant manufacturer’s internal production lines. Promimic is transitioning from being a development phase company to a commercial business. The progress over the past two years has resulted in the customer base growing to 12 (from four in 2015), with a solid pipeline of further evaluations underway. The business model is to sell non-exclusive licenses to the medium and large implant and dental companies. Exclusive licenses are limited to tightly defined sub-segments in terms of geography, application and implant material. The licenses will carry a royalty, typically 2%-5% of net sales, with a consumable element, the HAnano Surface coating liquid, also sold. Most of the potential customer base is in North America and a US office is being established in Q4 16 (Promimic Inc) to better address these opportunities. Three non-exclusive licensing agreements were signed in 2015/6. In 2015 Sistema de Implante Nacional (S.I.N), a leading provider of dental implants in Brazil, signed up and in January 2016 launched the first product using Promimic’s technology (in August 2016 it was announced that sales had exceeded S.I.N.’s internal expectations). The other agreements are with Amendia Inc. (2015) for use with its patient-focused spinal implant and Danco Anodizing (2016) where Danco will invest in a production line and be the preferred process partner for Promimic for the USA and China medical implant market. A number of evaluations are currently underway and further agreements, including with several major manufacturers, are expected in the near- and medium-term. Dilafor AB is a drug development company that is developing pharmaceutical products for obstetric indications. The company was founded in 2003 and is based in Solna, Sweden. The approach centres on exploiting the broad range of non-anticoagulant activities that heparin has, in this case to help promote cervical ripening and myometrial contractility. The principal product is tafoxiparin, a modified form of heparin that is optimised for these indications. It is in clinical development to decrease the incidence of protracted labour both after induction of labor and after spontaneous onset of labour. A Phase IIa trial was performed in 263 first-time mothers; a sub-group analysis showed significantly fewer women were in labour for more than 12 hours compared to placebo and similarly also indicated that labour times were shorter in the induced labour sub-group. Tolerability and safety replicated the positive results seen in the Phase I study. A financing round raising SEK51m ($5.9m) to fund the Phase IIb dose ranging study in Northern Europe (due to start by end-16) was completed in October 2016. Under a licence agreement with Lee’s Pharmaceuticals the results will be used to guide their Phase II and III trial programme in China. As a result of the new financing, Karolinska Development has decreased its indirect holdings via KDev Investments in Dilafor from 53% to 35%. The new investors include Lee’s Healthcare Industry Fund, Rosetta Capital IV and Pila AB. Umecrine Cognition is Swedish company that was founded in 2006. It is developing compounds that act on endogenous CNS-active steroids (GABA-steroids), with the lead indication being for Hepatic Encephalopathy. GR-3027 is a first-in-class agent that acts to reverse the increased GABAA signalling that is believed to cause the clinical symptoms of cognitive and motor function impairment. The clinical programme is funded by a syndicate of local investors who raised SEK12.6m during H116. A two-part Phase I trial in healthy volunteers (reported in November 2016) showed encouraging safety and tolerability, with promising signs of the GABAA inhibition seen in pre-clinical studies. Further details are due to be presented at the 9th International Meeting – Steroids and Nervous System in Turin, Italy (February 11th -15th 2017). Karolinska Development is exposed to all the risks that its portfolio companies face, including the development, regulatory, commercialisation and financial risk of young companies in the biotech and medtech sectors. However, these risks are diversified across the 10 portfolio companies, limiting both the downside and upside of events on Karolinska Development. Two other issues that could impact the returns of investors in subsequent years are the decisions of its strategic partner Rosetta Capital (see later in Financials section) and the holders of the convertible debt. In March 2018, Karolinska Development could be obliged to buy out Rosetta Capitals position in KDev Investments, which could result in shares worth 10% of Karolinska Development’s market cap being issued to Rosetta Capital. In December 2019, debt valued at SEK568m will need to be repaid, be converted into shares (conversion price is SEK22), or be renegotiated. We consider a sum-of-the-parts DCF-based methodology (including rNPV where relevant) to be the most appropriate way to value Karolinska Development. 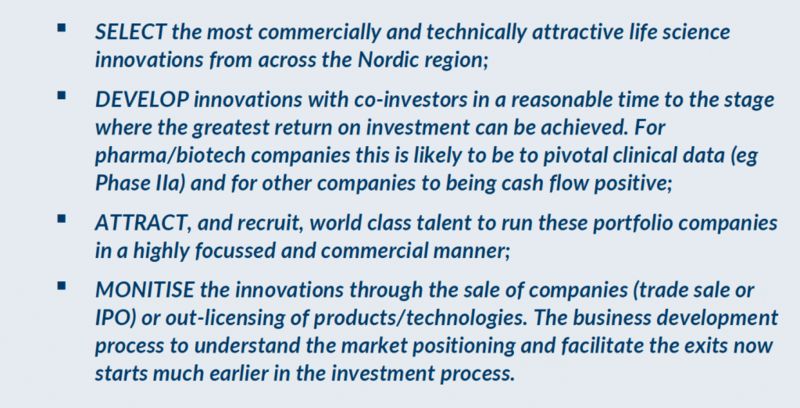 As always, we employ conservative assumptions and have only valued the company’s four key late-stage investments, as indicated in Exhibit 7, to value Karolinska Development at SEK473m, or SEK9.10 per share. 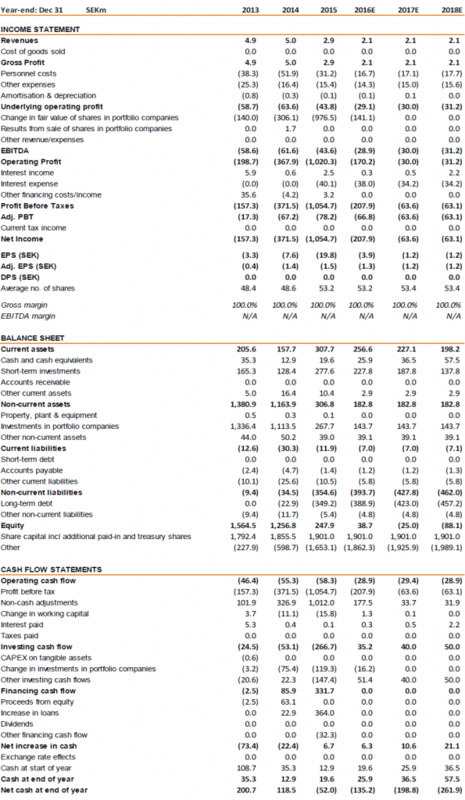 This suggests that there is a 52% upside to the current share price. The inherent value of the earlier-stage investments in the portfolio should be viewed as additional upside. In comparison to our valuation of SEK473m, Karolinska Development’s NAV was SEK71m (SEK1.35 per share) and the accounting fair value of its investments is SEK144m (SEK2.77 per share) at H116. It should be noted that Karolinska Development follows the International Private Equity and Venture Capital Valuation Guidelines to value the investments in its portfolio companies. This is a most prudent and conservative approach in that the value of each holding is based on the post-money valuation of the company’s last funding round with a third party investor regardless of the company’s progress; although values may be written down as a result of setbacks (eg. 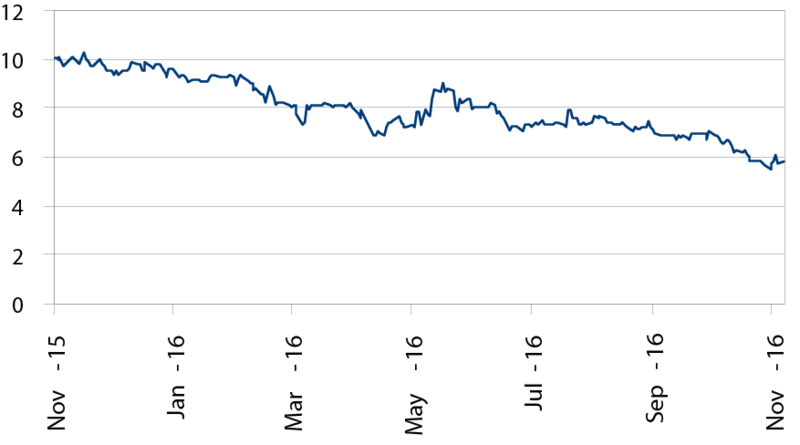 the book value of Akinion Pharmaceutical was reduced by SEK119.4m in Q116, following the discontinuation of its lead product AKN-028). No investments are assessed using simple DCF methods, which should only be used for companies with revenues that can be predicted with a greater degree of certainty. Consequently, we would expect our valuations of Karolinska Development’s investments to be materially higher than the book values. Source: Trinity Delta; Note: 1 % owned by Karolinska Development directly or by KDev Investments; 2 Companies owned by KDev Investments, in which Rosetta Capital owns 7.5% of the equity. Both Aprea and Promimic have completed third-party funding rounds this year; Aprea raised SEK437m ($51m) during a Series B round in March 2016 and Promimic raised SEK23.8m ($3.2m) in September to fund its US commercial . This capital raises were largely supported by third party investors with Karolinska Development ownership of Aprea being reduced from 62% to 19% and of Promimic from 37% to 33%. These funding rounds provide external validation of the commercial potential of the companies, but it is not possible to derive the post-money valuations of these Aprea and Promimic because they have complex financial structures. Within Karolinska Development’s investment portfolio, we see most potential upside with Aprea. 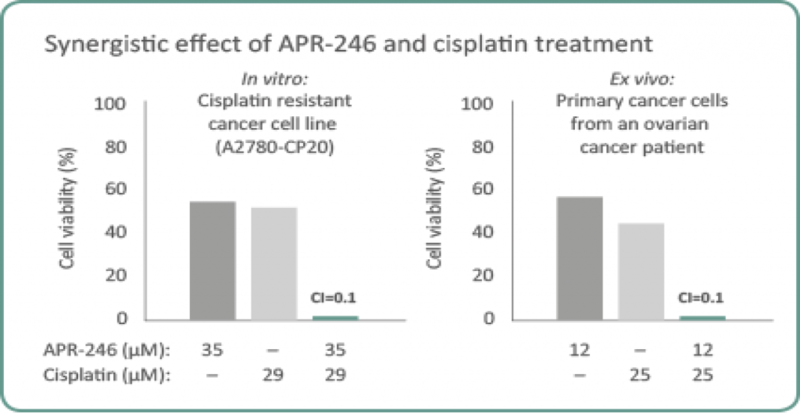 As Aprea’s lead product APR-246 advances through clinical development, the likelihood of success will increase (assuming that the clinical trials continue to deliver promising results). On top of this, we believe that our peak sales estimate could increase materially; our current peak sales estimate is based only on its potential in ovarian cancer, but as changes in P53 (APR-246’s target) is associated with most tumours, APR-246 could be used to treat many other cancers. There is also upside to our valuation from the investments in the six other portfolio companies. At this stage we believe that there is limited value in these companies due to the size of the shareholding, the early stage of the company or the market opportunity. That said, this might change and they could offer significant upside. Similarly, for the same reasons, we have placed no value on the various earn-out agreements that Karolinska Development has on the divested investments. Clearly as progress is achieved, we would expect to revisit the various elements of our models and anticipate the valuation would reflect this. Over the last 18 months, Karolinska Development has focused on concentrating its resources on those assets most likely to generate an attractive return and be in a position to support all of its investments. It had SEK268m at 30 June 2016, which Karolinska Development believes should allow it to fund, together with third party investors, its portfolio companies appropriately, so that they are able to fulfil their potential. We estimate that over the next three years, Karolinska Development could invest over SEK100m, and at 30 June 2016 it only had SEK43.0m provisionally allocated for investment in KDev Investments (Aprea, Modus Therapeutics, Dilafor, Promimic and Inhalation Sciences are held by this investment vehicle), and we do not expect major investments in the other companies. Thus, Karolinska Development is in the position to add to its portfolio of companies, assuming of course it is able to identify attractive opportunities. Rosetta Capital also has a put option, which can be exercised on or after 7 March 2018 and would require Karolinska Development to acquire Rosetta’s position if Rosetta has not received a return equivalent to 2.5x the amount it has invested in KDev Investments. The price payable, in either cash or shares in Karolinska Development, would be based on the fair value of KDev Investments and the dividend distribution formula above, but with the value capped at 10% of the market cap of Karolinska Development, i.e. the fair value of KDev Investments was SEK267m so the current potential distribution is SEK257m (including investments worth SEK32m which are repayable to Rosetta, before the application of the formula), however, as the market cap is SEK312m, Karolinska Development would only have to repay SEK31.2m. The divestment of Clanotech to Rosetta Capital in July 2016 has no impact on the ownership structure of KDev Investments. At the moment, it appears likely that Rosetta Capital will be entitled to exercise its put option, but we consider that it is unlikely that the option will be exercised due to the current market cap of Karolinska Development. Should the option be exercised, we believe Karolinska Development would make any payment to Rosetta in shares to preserve its capital to invest in the portfolio companies. To support the funding of the portfolio companies, Karolinska Development issued convertible debt in January 2015 with a nominal value of SEK387m. The nominal interest is 8% and it is due for repayment on 31 December 2019, when the debt holders have the right to have the debt converted into shares at a conversion price of SEK22 per share. The interest can be accrued, and assuming that this occurs, the amount repayable will be SEK568m or 25.8m shares. In FY13 and FY14, the main reason for the reductions in the fair value of shares in portfolio companies because of those companies suffering clinical trial setbacks or being unable to complete successfully funding rounds. In contrast, the fall in FY15 was primarily due to Karolinska Development divesting various positions, as it right-sized its portfolio, so that their accounting value was reduced to zero, although the investment company retains upside from earn-out agreements. Our forecasts in Exhibit 8 do not include any potential transactions (investments or divestments) or assumptions regarding changes in the fair value of investments. Bo Jesper Hansen Non-Executive Chairman Previously Chairman of Swedish Orphan Biovitrum AB. Board member of GenSpera Inc., Newron SA, Ablynx NV, Orphazyme A/S and CMC Kontrast AB. Previously at Swedish Orphan International AB, since 1993, including CEO from 1998 to 2010. Also medical advisor for Synthélabo, Pfizer, Pharmacia and Yamanouchi. Jim Van heusden CEO Joined as CEO in March 2015. Previously Founder and Managing Director at bioskills (2013 to 2015) and as Partner at the European investment company Gimv (2001 to 2013). Senior Scientist at Janssen Pharmaceuticals (Johnson & Johnson) from 1993 to 2011. Also served as a Board member in several biotech companies including Multiplicom NV (as Chairman), Ablynx NV, ActoGeniX NV, Pronota NV and Prosensa. Holds a PhD in molecular and cellular biology from the University of Maastricht. Viktor Drvota CIO Joined as CIO in February 2016. Previously Head of Life Science at SEB Venture Capital (2002 to 2015). Prior to this Senior Consultant in Interventional Cardiology and Associate Professor in Cardiology at the Karolinska Institute. Has published 29 articles in international peer reviewed scientific journals. Served as a board member of several Biotech and Medtech companies such as Arexis AB, Scibase AB, SBL Vaccine AB, Nuevolution AS, Airsonett AB, Avidicare AB, Index Pharmaceuticals AB, and Neoventa AB. Involved in numerous exits, such as the Arexis sales to Biovitrum, SBL Vaccine sale to Crucell, Cresco SA sales to Astra tech, and PhaseIn sale to Massimo Inc. Also several IPOs such as Nuevolution and Scibase. Responsible for new financings with an aggregate amount of over SEK2bn raised. Holds an MD and a PhD from Karolinska Institute.